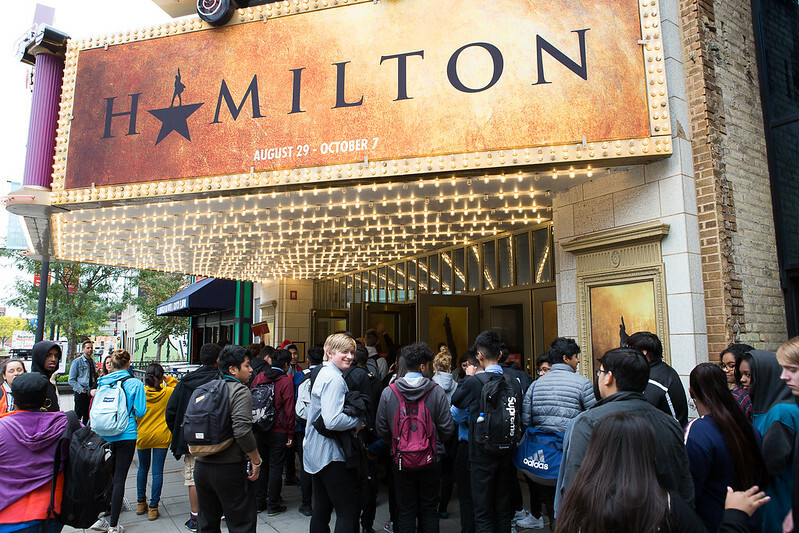 Project SUCCESS brought 5,000 students from the region to see Hamilton at no cost to them in September and October 2018. Explore stories, videos and media coverage from the day below. Curious how this amazing partnership came together? Read our first blog post from September 2018. In September, Project SUCCESS facilitator Ryan prepared Folwell School Performing Arts Magnet students to see Hamilton during his in-class workshops by discussing the history of Alexander Hamilton and the themes explored in the musical. Students watched videos about Hamilton growing from its original concept to the full-scale production, then did some personal reflection, connecting quotes from the musical to their own life experiences. Their exploration of history and legacy culminated in an opportunity to experience the show for themselves! Each 8th grader was able to bring one guest to the performance; some of the students invited their previous or current teachers who inspire them. In September and October, thousands of students came together to see the Broadway hit during two Hamilton Education Program (“EduHam”) days in Minneapolis. The students’ on-stage performances wowed us. Their excitement and enthusiasm were infectious. And here at Project SUCCESS, our longtime dream of bringing students to Hamilton came true as we watched an incredible day unfold for our students. Students had a chance to to see the show for themselves, but first, a number of students performed their own Hamilton-inspired pieces on stage before the show. The days also offered students an opportunity to do a Q&A with the cast and crew of Hamilton — from lead characters, to stage and prop managers, to swing actors and members of the orchestra, each person shared their incredible and varied perspectives. The Hamilton Education Program Minnesota occurred because of our work in partnership with the Hamilton producers, the Miranda Family, The Gilder Lehrman Institute of American History and The Rockefeller Foundation. Local Hamilton programming and access to performances through the Hennepin Theatre Trust were made possible by major grants from Aroha Philanthropies, devoted to the transformative power of the arts and creativity; Target, putting the needs of people, communities and the planet at the heart of how we work today, to help build a better tomorrow; and the Minnesota Vikings and the Wilf Family Foundations, who are dedicated to advancing the well-being of youth through education.